At the site of the bungalow of Raja Jai Singh, where Sri Guru Har Krishan Sahib stayed when summoned to Delhi by Emperor Aurangzeb now stands a stately Gurdwara Bangla Sahib. This Gurdwara was initially established in 1783 by Sardar Baghel Singh. At this time the four sons of Emperor Shah Jehan - Dara, Shujah, Aurangzeb and Murad were fighting to ascend the throne of Delhi. Out of these Sri Guru Har Rai Sahib helped Dara which annoyed Aurangzeb. Finally, when Aurangzeb came to power he sent a message to Sri Guru Har Rai Sahib to come to Delhi to explain his position. Sri Guru Har Rai Sahib sent his elder son Ram Rai in his place along with his minister Dargah Mall. Sri Guru Har Rai Sahib instructed Ram Rai to remain fearless, speak the truth and not show any miracles. On reaching Delhi to please Aurangzeb Ram Rai distorted the bani of Sri Guru Nanak Dev Ji. When Aurangzeb asked Ram Rai as to why Sri Guru Nanak Dev Ji had insulted the Muslims by writing "Mitee Musalmaan Ki" (SGGS, page 466) Ram Rai deliberately distorted the hymn of Sri Guru Nanak Dev Ji and said the words are 'Mitee Beimaan Ki". Ram Rai also showed miracles. He made alive a ram, rode an amuck elephant, told a person what he had eaten, showed stars during day, unlocked locks without a key etc. He showed as many as fifty-two miracles. Sri Guru Har Rai Sahib got annoyed with Ram Rai because he had distorted the hymn of Sri Guru Nanak Dev Ji. He anathematized him and sent a message to him that he should not show his face to him. Because of this fact Sri Guru Har Rai Sahib chose his younger son Har Krishan Ji as his successor ignoring his elder son Ram Rai. Thus the main reason why Sri Guru Har Rai Sahib chose Har Krishan Ji as his successor was the fact that Ram Rai had distorted the hymn of Sri Guru Nanak Dev Ji. 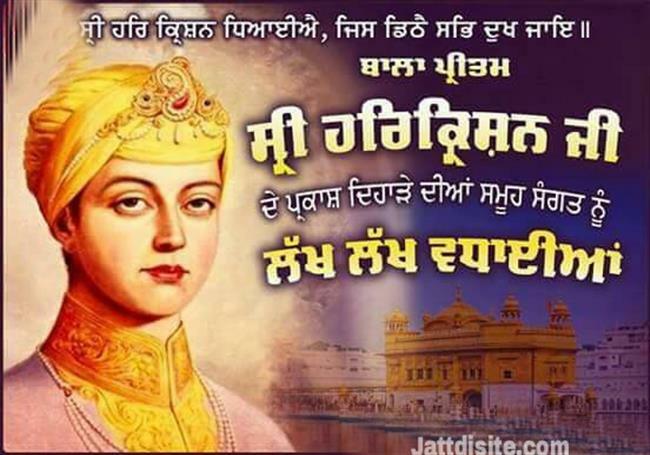 On 6 October, 1661 he conferred Guruship on his younger son Har Krishan Ji who was only five years old at that time. Thus, Har Krishan Ji became the eighth Guru of the Sikhs. In appreciation of the young Guru, Bhai Santokh Singh, in his monumental book Sri Gur Pratap Suraj Granth says, "The early morning sun looks small in size, but its light is everywhere. So was young Guru Har Krishan's fame without limit." This shows that Sri Guru Har Krishan Sahib was spiritually as sound as an adult. He imparted true knowledge to his followers. He had the ability to explain passages from Sri Guru Granth Sahib (the Holy book of the Sikhs) with clarity. Taking advantage of the young age of Sri Guru Har Krishan Sahib, Ram Rai declared himself as the Guru on his own and gave him many troubles . Ram Rai asked Aurangzeb to help him in snatching Guruship from Sri Guru Har Krishan Sahib. Aurangzeb summoned Sri Guru Har Krishan Sahib to Delhi through Raja Jai Singh of Amber (Jaipur). Sri Guru Har Krishan Sahib left for Delhi along with his mother Mata Sulakkhani Ji and his grand-mother Mata Bassi Ji. On his way to Delhi after travelling through Ropar, Banur, Rajpura and Ambala, on the third day of the journey he reached the village Panjokhra, which is 10 km north-east of Ambala city along the Ambala-Naraingarh Road. At this place he was informed that Sikh Sangats were coming from Peshawar (now in Pakistan), Kabul (now in Afghanistan) and Kashmir to pay their obeisance. Thus, he decided to stay at Panjokhra for a day. In this village a very learned but proud Pandit (scholar) named Lal Chand came to see him and spoke insultingly saying that "It is said that you sit on the gaddi of Sri Guru Nanak Dev Ji. But what do you know of the old religious texts." Incidentally, at this time Chhajju Ram, an illiterate, dark skinned Jheevar (water carrier) by caste who was carrying a bundle of hay on his head happened to pass by them. Sri Guru Har Krishan Sahib asked Chhajju Ram to explain the gist of the Bhagwad Gita, the sacred book of the Hindus. To the astonishment of all who were present there, Chhajju Ram quickly and clearly explained the gist of this sacred book. Pandit Lal Chand felt ashamed and overcame his pride. He and Chhajju Ram became Sri Guru Har Krishan Sahib's disciples and accompanied him upto Kurukshetra. Pandit Lal Chand later adopted Sikhism. In Sri Guru Gobind Singh Ji's time he was renamed as Lal Singh. He died as a Sikh warrior in the battle of Chamkaur Sahib on 7 December 1705. Sri Guru Har Krishan Sahib stayed at Panjokhra for three days. Upto Panjokhra a large number of Sikhs had accompanied him. But on reaching here except for a selected few, he asked them to go back. It may be mentioned that in Panjokhra at the spot consecrated by Sri Guru Har Krishan Sahib, a memorial has been raised in his honour which is named as Gurdwara Panjokhra Sahib which constitutes a vast complex including a double storey sanctum, an enclosed sarovar, Guru Ka Langar (Community Kitchen), buildings for the staff and pilgrims who visit the Gurdwara from far and near throughout the year especially during Magh sudi 7 to 9, the days of stay of Guru Sahib at this place which falls in January or February. On reaching Delhi Sri Guru Har Krishan Sahib stayed in the bungalow of Raja Jai Singh of Amber (Jaipur). He was asked by Aurangzeb's courtiers to meet Aurangzeb. On 25 March, 1664 he met Aurangzeb, who had pre-planned a trial for him. Two large trays were brought before him, one of these had expensive clothes, toys and ornaments and the other had a holy man's cloak and a cowl. Sri Guru Har Krishan Sahib accepted the second one which had a cloak and a cowl. Aurangzeb called Sri Guru Har Krishan Sahib a second time with the intention to ask him to perform some miracles. Guru Sahib had an inkling as to why the Emperor wanted to see him a second time. Since he believed that no one should show miracles because it involved disturbing the law of nature he refused to see the Emperor. At this time, in Delhi smallpox was ravaging. Sri Guru Har Krishan Sahib took lot of pains to take care of the smallpox ridden people. As a result of his strenuous involvement in this activity, he himself was inflicted with this disease. All his disciples became very sad. As reported by Bhai Santokh Singh in his book Sri Gur Pratap Suraj Granth his mother Mata Sulakkhani Ji said to him "Son, you occupy the gaddi of Guru Nanak. You are the dispeller of the world's sorrow and suffering. Your very sight removes the ailments of others. Why do you lie sick now." Sri Guru Har Krishan Sahib promptly replied, "He who has taken this mortal frame must go through sickness and disease. Both happiness and suffering are part of life. What is ordained must happen. This is what Guru Nanak taught. Whatever one does is in accordance with His order. One must live in the light of His command." After falling ill Sri Guru Har Krishan Sahib moved out of Raja Jai Singh's bungalow to a place on the bank of Yamuna river. The Sikhs by this time had become very desperate. As reported by Bhai Santokh Singh, Sri Guru Har Krishan Sahib instructed them that 'Guru Nanak's throne is eternal. It is everlasting and will continue to command ever increasing honour. The Granth is the Lord of all. He who wants to see me let him with faith and love see the Granth. Thus he will shed all his sins. He who wishes to communicate with the Guru, let him read the Granth with devotion. He who practises its teachings will obtain all the four padaraths (materials). He who has faith gains everything. He who is without faith acquires but little. None in his world lives forever. The body is mortal. In the Granth abides the Guru's spirit. Daily bow your head before the Granth. In this way you will conquer your passions and attain liberation." At the site of the bungalow of Raja Jai Singh, where Sri Guru Har Krishan Sahib stayed when summoned to Delhi by Emperor Aurangzeb now stands a stately Gurdwara Bangla Sahib. This Gurdwara was initially established in 1783 by Sardar Baghel Singh. The birth anniversary of Sri Guru Har Krishan Sahib is celebrated every year all over the world by Sikh Sangats but especially in Gurdwara Bangla Sahib with great pomp and show. This year the birth anniversary is being celebrated on July 18 by the Sikh Sangat all over the world. Because Sri Guru Har Krishan Sahib tendered to all smallpox stricken patients irrespective of their religion, being impressed by his humanitarian outlook the Muslims of Delhi nick named him Bala Pir (child prophet). That is why the Gurdwara raised at the site of his cremation has come to be called Gurdwara Bala Sahib which falls between Mathura Road and the bent of Ring Road in Delhi. On March 30, 1664 Just before leaving for his heavenly abode Sri Guru Har Krishan Sahib asked his attendants to bring the ceremonial marks of succession and uttered the words "Baba Bakale" i.e. the next Guru is in the town of Bakala which now falls in Amritsar district of Punjab.